In a new paper, which appears in the Proceedings of the National Academy of Sciences, the researchers delve further into a glycoprotein complex they began to define in a 2014 paper. Lead author Xingcheng Lin, a postdoctoral research at Rice, modeled that part of the protein, the B-loop of the HA2 domain. HA2 sits beneath another domain, a cap known as HA1 that mutates to escape past defenses. Lin explained that HA1 is a common target for flu medications because the exposed cap domain is more accessible than the protected HA2 domain. The problem is that HA1 mutates constantly to resist drugs, he says. That influences how effective flu vaccines are every year. Lin and Onuchic says HA2 presents a better target for drugs because the mechanism is highly conserved by evolution. Onuchic and his colleagues are pioneers in the theory that folding proteins follow an orderly, “funneled” process that depends on the intrinsic energy of every atom in the chain, each of which constantly seeks its lowest energy state. If all the atomic “beads” can be identified, it’s possible to simulate the complex folding process. The researchers often use coarse-grained models of proteins, a subset of atoms that represent the whole, to predict how they will fold. The new study was much more ambitious and set out to predict the complex unfolding and refolding by using not only every atom in the chain but also every atom in its liquid environment, Onuchic says. Lin modeled 40 microseconds (millionths of a second) of the HA2 domain transition that represents the entire process, which takes 1.4 milliseconds (thousandths of a second) to complete. Even that shortened process took two years of computer time to deliver results, he says. 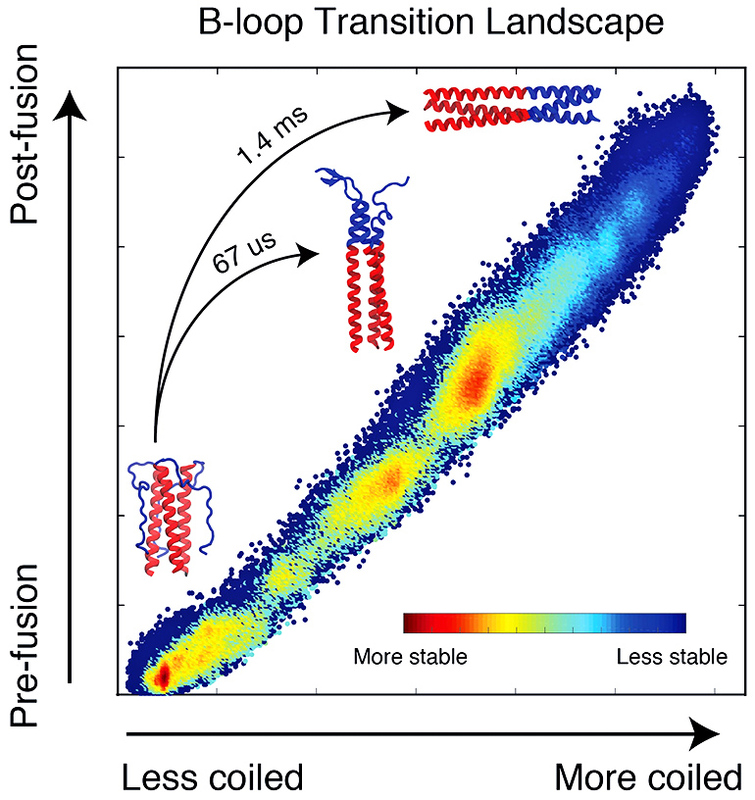 Previous theories based on crystallographic images of the before-and-after proteins put forth the idea of a spring-loaded domain that appeared to attach to the target cell after the cap’s removal. Onuchic says the complete model of HA2 supports a different mechanism. “We figured out there’s a bunch of energy that makes the final state of HA2 much more stable than the initial state,” he says. “But with the spring-loaded mechanism, most of the energy would already be wasted by the time it forms the coiled coil and binds the cell and viral membranes. It wouldn’t leave any energy to pull the membranes together. The current research focused on the group that incorporates Thr59 and causes the H3N2 strain responsible for the Hong Kong flu, Lin says. The other residue, Met59, appears in the H1N1 strain that caused the Spanish flu. Additional coauthors are from Rice, Baylor University; and the Max Delbrück Center, Berlin. The National Science Foundation, the Welch Foundation, and the National Institutes of Health supported the research. The NSF-supported DAVinCI supercomputer, the BlueBioU supercomputer, and the NOTS cluster administered by the Center for Research Computing and procured in partnership with Rice’s Ken Kennedy Institute for Information Technology provided computing resources. The researchers also used the Anton supercomputer at the Pittsburgh Supercomputing Center, which D.E. Shaw Research made available, as well as the NSF-supported Extreme Science and Engineering Discovery Environment supercomputer. The post Weak link could lead to universal flu vaccine appeared first on Futurity.